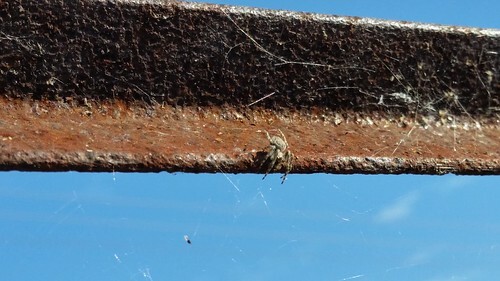 A spider on a bridge climbing onto its web. I know, I know...I keep posting bugs, but I think part of my fascination with taking pictures of bugs is that I can take pictures of bugs with my cellphone and they come out this good. Here, the vibrant blue of the sky with occasional white puff makes the rust-brown of the railing stand out but also helps to draw out the spider's webs. And then, of course, there's the spider about to crawl out onto this web and make dinner of the fly just to the left of him. His brown blends easily to the railing for much of the animal kingdom but is distinct enough for him to be blear to us.